The Lake Minnetonka subwatershed is located in the central part of the upper Minnehaha Creek Watershed District (MCWD or District), and includes both direct drainage areas to the lake as well as minor subwatersheds. The subwatershed contains all or parts of the cities of Orono, Minnetrista, Mound, Spring Park, Shorewood, Minnetonka Beach, Tonka Bay, Wayzata, Woodland, Deephaven, Minnetonka, Greenwood, Excelsior, Victoria, and Chanhassen. The subwatershed is dominated by Lake Minnetonka, but also includes several smaller lakes and numerous wetlands. Major streams that discharge into Lake Minnetonka include Six Mile Creek, Dutch Creek, Painter Creek, Classen Creek, Long Lake Creek, and Gleason Creek. Lake Minnetonka outlets at the Gray's Bay dam into Minnehaha Creek. Most of the various bays that make up Lake Minnetonka meet or exceed their water quality goals, although there are some bays that fall far short. Only a few of the other lakes have established goals, and limited data is available to assess their water quality. The streams that drain the other subwatersheds in the Upper Watershed convey significant phosphorus and sediment loads to the lake, and are a major cause of the poor water quality in some of the bays. In decades past, several sewage treatment plants operated in the upper watershed, and their discharges conveyed significant phosphorus loads to the lake. Since those plants discontinued operation, the water quality in the lake has improved considerably, but those old discharges may continue to influence water quality from phosphorus in the lake sediments. Lake Minnetonka is the region's premier recreational and fishing lake, with an excellent, nationally-recognized bass and sport fishery. Eurasian watermilfoil is a nuisance in several bays and channels, and the Lake Minnetonka Conservation District harvests several areas on a continuing basis. Numerous high-value wetlands are present in the subwatershed. Read the Lake Minnetonka Subwatershed Plan from the MCWD Watershed Management Plan. In 2016, Hennepin County carried out road construction on Highway 101/Bushaway Road in Wayzata, Woodland and Minnetonka, and the MCWD worked as a partner to protect and enhance Lake Minnetonka. Bushaway Road runs from U.S. Highway 12 to Minnetonka Boulevard and crosses Lake Minnetonka between Gray's Bay and Wayzata Bay. The road construction project made a variety of improvements to the road, including adding turn lanes and a bicycle/walking path. 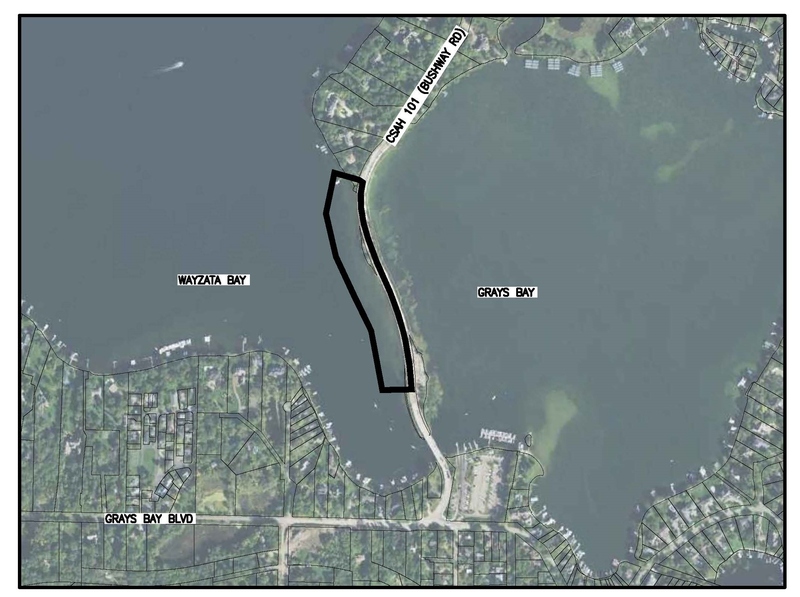 The MCWD partnered with Hennepin County on the project to protect and enhance the shorelines along the road as it crosses Lake Minnetonka. The project used plants and other bioengineering techniques to stabilize the shoreline, which will reduce erosion, infiltrate stormwater, provide habitat and improve the aesthetics of the area. The District has used similar techniques to reduce erosion at Lake Minnetonka's Big Island and operates several shoreline demonstration sites along Lake Minnetonka. As part of the project, the District also partnered with the City of Minnetrista to carryout a wetland restoration to fulfill a District permit requirement for the District's Highway 101 shoreline project. The wetland restoration created flood volume replacement by excavating and regrading the land to reestablish fringe hydrology and restored prior wetland conditions.